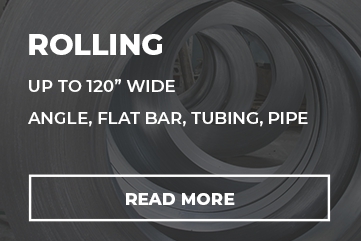 VeriForm has been fabricating carbon steel for over 20 years, with no plans of stopping. 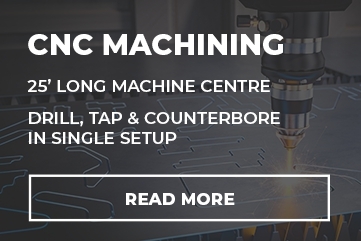 Our experts can fabricate any part, big or small, simple or complex, that you will ever need. Our experience and equipment ensure that you get the best carbon steel parts possible. 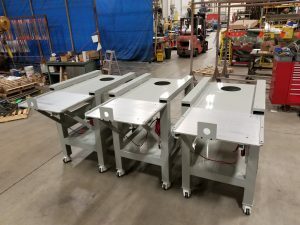 Here are 3 custom built tables built for quick die change applications complete with adjustable wheel heights and electrical power. Not only can VeriForm build to suit your prints but we can help with the design to get you more efficient costing based on our experience with what works and what does not. 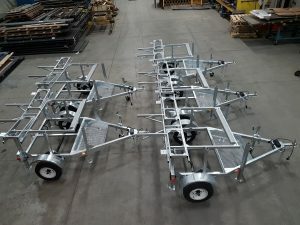 Here are 5 emergency road closure trailers built from scratch at VeriForm, complete with electrical wiring, rear lights, all-terrain wheels and trailer hitch for towing. These 5 units were hot-dip galvanized and are ready for pickup. The following 24 foot x 13.3 foot downdraft system shipped to Illinois USA July 21st to a prestigious client’s showroom. 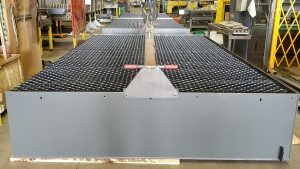 The VeriCUT design along with customer’s slat frame concept allows lasers to cut with up to 10 kilowatts of power through 2 inch thick steel plate. The client required the unit to meet +/-0.030 inch tolerances for flatness and VeriForm achieved this without machining by using special German built Demmeler welding tables. Photo of heavy duty truck platform. 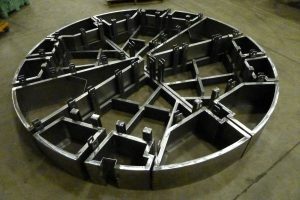 This shows our ability to manufacture complex and complete assemblies. 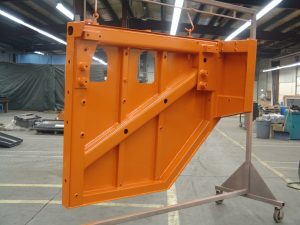 This weldment was created from 6 inch thick A36/44W plate, A572 grade 50 (350W) flat bars and 11ga A1011 CQ steel formed, rolled, machined. Then the welding was performed by CWB certified staff using a weld conditioning system so that all stress relieving was done during welding and none was required after welding. Our client reported zero distortion and superb flatness. 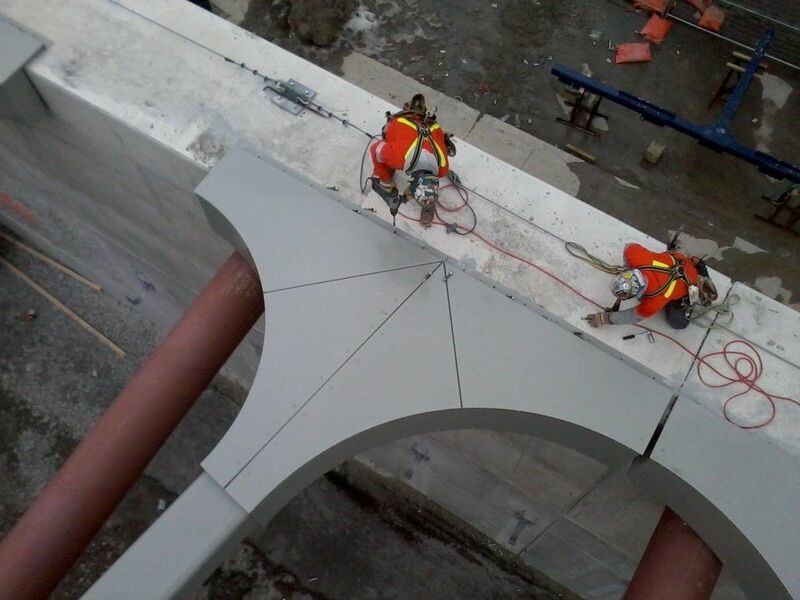 Need Large Carbon Steel Fabrication? 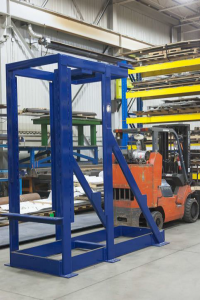 With the biggest equipment in the industry, VeriForm is able to fabricate individual components up to 20 feet, for use in larger parts or products. With our highly trained team and precision equipment, you can be confident that your carbon steel components & parts are right on spec. 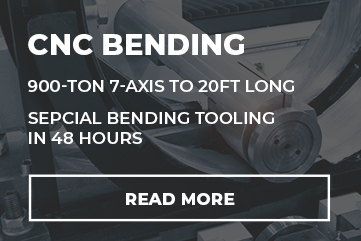 With over 20 years and counting fabricating with carbon steel, you can be confident that you’ll get the highest quality parts as well as the best engineering advice. Large, small, simple, or complex, VeriForms team of experts will do it right the first time.